Yurbuds Focus 300 for Women Sport Earphones at Bodybuilding.com - Best Prices on Focus 300 for Women Sport Earphones! Let your music motivate you with exceptional sound that stays put. TwistLock® Technology and FlexSoft® Comfort Fit guarantee these sweat-proof behind-the-ear sport earphones will never fall out or hurt, and our exclusive Quik Clik® Tangle-Free Magnets make them easy to wear and store. yurbuds® Focus® 300 also features a microphone with one-touch music and call control compatible with most smartphones. 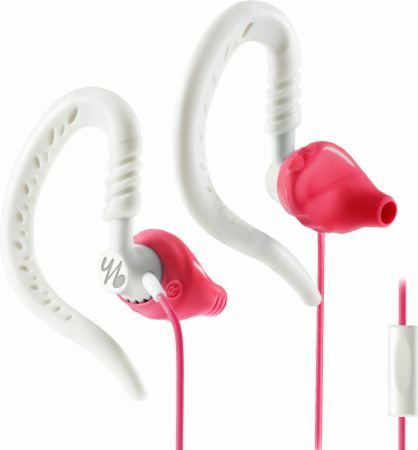 yurbuds Focus 300 for Women Sport Earphones, carrying pouch and 2 pairs of enhancers. No Focus 300 For Women Reviews Found.